MYKEL BOYD, an experimental sound and visual artist, is making a triumphant return to the Empty Bottle stage. As well as being one half of BOKEH, Boyd also runs Somnimage Records. Managing to trap you in a sonic wonderland that you won't mind getting lost in, MYKEL BOYD lures you in with quiet, static pulses, transporting you to a strange world enveloped in an ethereal sound. His transient, experimental hum is certain to leave you feeling out of this world. COPPICE, the duo known for bending genres with their unorthodox instruments, is making their Empty Bottle debut this hump day. Although their output ranges from compositions to recordings to sculptures, one thing is consistent: their ability to create haunting, transcendent art that is in a genre all its own. 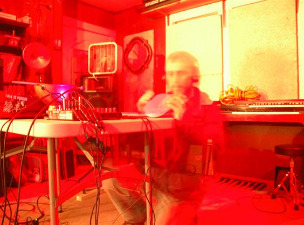 NICHOLAS SZCZEPANIK will be opening up the night with his ambient, dream drone, minimalism sleep sound. Prepare yourselves for a gooey, sonically rewarding Wednesday night with this trifecta of otherworldly goodness.